You are here: Home / Technology & Software / Micron Contract Manufacturing Services, Inc.
With revenue of approximately $500 million, Micron Contract Manufacturing Services ("MCMS") was a leading provider of electronics manufacturing services to original equipment manufacturers that primarily serve the data communications, telecommunications, and computer systems industries. 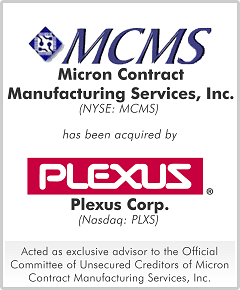 MCMS was heavily leveraged as a result of an earlier leveraged buyout from Micron. MCMS hired an investment banker that pursued various strategies to maximize value, including a sale. The investment banker recommended that MCMS enter into a sale agreement with a buyer in which the investment banker had a 50% equity interest. MCMS' Official Committee of Unsecured Creditors hired M&A Capital to identify other potential acquirers or financing sources to maximize value. The sale process resulted in MCMS selling to Plexus at a transaction value significantly higher than the originally recommended offer.